How can I find out the IP address of the windows computer? What are the steps that I need to do to check the IP address of the windows computer? Re: What are the different ways to check the IP address of the windows computer? There are basically two ways to find out the IP address that your windows computer is getting. IP address is basically the address on your computer on the virtual network. You can click on the start menu and click on control panel. In control panel you will find the option called Network and Sharing Center. In Network and Sharing center, you will find on the left pane an option called Change adapter settings. In the new page that appears, you will have all the connections available on the computer. You need to right click on the icon which shows connect and click on status. There you will find the IP address. You can also check the IP address through the command prompt. 2.Type"ipconfig" with out quotes then press enter.This displays basic information about main network adapter.the IP address is clearly marked. 3.type "ipconfig\all" without quotes displays information about all network adaptors on computer.This includes wireless and wired adapters.The IP address for each adapter is clearly marked. your ip address will be displayed. 2)there are various sites like whatismyip.com can also tell your system ip address. visit these sites and they will display your ip address. Then click on the adapter settings and than right click on the LAN icon. Select ipv4 from the list of options. Than you will see the ip address of your system. The second way is install a LAN viewer on your system and than run it. It displays the IP address of all the systems connected on your network including yours. In addition to that it also shows the mac address of the computers. >In command prompt type "IPCONFIG"
There Are Way To Know You Internet Protocol Address !! Without Giving Space Type "ipconfig"
You Will Get It . .!! here are the steps to check the ip address. 1-Go to the "Start" menu and type "CMD" in the "Search" field. Click on the "Command Prompt" shortcut in the search results. 2-Type "ipconfig" without the quotes and press "Enter." This displays the basic information for your main network adapter. The IP address is clearly marked. 3-Type "ipconfig /all" to display information for all the network adapters on your computer. This includes wireless and wired adapters. The IP address for each adapter is clearly marked. 2)there are various sites like what is my ip.com can also tell your system ip address. now run window will get opened. Type CMD in the Run field. Now Type"ipconfig" with out quotes then press enter.This displays basic information about main network adapter.the IP address is clearly marked. Type "ipconfig\all" without quotes displays information about all network adaptors on computer.This includes wireless and wired adapters.The IP address for each adapter is clearly marked. 1.Click the Start menu button. 2.Type run in the search box and then click ok.
3.Type cmd in the run box to open command prompt. 4.In the windows that opens type ipconfig /all. 5.The 'IP Address' field states the current IP address for that network adapter. There are lot of ways in which you can see your IP address of your computer. When you change your network then your IP address changes. and hit enter. it will show you the IP address. Otherwise there is a application called rainmeter download and install it. It will show you the IP address. you can do it,just follow my steps. 1.open control panel from the start menu. 2.open the network connections icon. 3.open the icon representing your pc's network connection. when you have more than one connection. 4.in status dialog box,click the support tab. the connection status area lists the ip address. 5.click the close button.thats it you have done. It will display your IP address . You can also check your ping , download speed and upload speed just click on begin test. 1) Click the Start button , open Control Panel, then select " Network and Internet " , and then click " Network and Sharing Center " . 2) Under Connection, click " View status " . 3) Click " Details " . A video is also been given this video clarifies how can you see your computer's IP address using CMD . This is very simply process to get our IP Address.Their is so many ways to find out the IP Address. one is IPV4 and IPv6. In present situation IPv4 is mostly used. 1. Press Win+R key The Run is opend. 2. Type Command to open Command prompt. 4. In that information Find out the ipv4 address. If you want to check your IP address. Then click "Win. + R". There you can see your IP address. If you want to check you connection IP address then go on your internet option icon. For this first go to control panel>networking and sharing center>change adapter setting. Your connection icon . Then right click on it and choose "properties". After this you will see a box . Choose "IPv4" with double click . You can now see your IP address on screen. press "cmd" and press "enter"
enter "ipconfig" and press "enter"
2) There are various sites like whatismyip.com can also tell your system ip address. If you want to Check the IP Address of the Windows Computer. Then, there are various methods for you to check it. >> Open "cmd" by using Start button and typing "cmd" in the Search Bar. >> Now, open it and type "ipconfig" followed by Enter. >> You will get information about your IP Address. >> Secondly, you can detect your IP address by using Internet. >> Just log on to Google and search "My IP Address". >> Your IP Address will be displayed in the Search Page of Google. 1. Go to the "Start" menu and type "CMD" in the "Search" field. Click on the "Command Prompt" shortcut in the search results. 2. Type "ipconfig" without the quotes and press "Enter." This displays the basic information for your main network adapter. The IP address is clearly marked. 3. Type "ipconfig /all" to display information for all the network adapters on your computer. This includes wireless and wired adapters. The IP address for each adapter is clearly marked. ou can do it,just follow my steps. 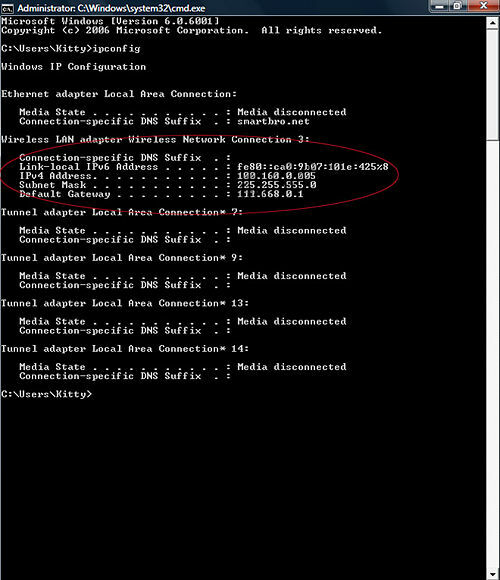 4) In command prompt type "IPCONFIG"
Do you want to know the IP address in windows computer there are two ways commimg first one following procedure. 2.click on the run button. 3.enter the cmd also known as command prompt. 4.in cmd you have to enter the IP config in windows computer. 5.there will be displayed IP address. This is very simply process to get our IP Address.1. Press Win+R key The Run is opend. So it is so simple to get ip address on windows computer..
1.First of all you have to know that ip address is the unique address of each computer..
3.Just type "cmd" on run window and then press enter.. IF you want more information or other way then just click on start button and then click on control panel and then network sharing center after that go to advanced setting option know here can also the ip address..
name than you will get the ip address. Go to start.then choose network place and then properties. Double click to wireless network connection to find IP address of your wireless connection. Select local are network connection to view IP address of your wired connection. choose the wireless network connection to view IP address of wireless adapter. click on detail and find IP address next to IPVP 4.
click view status button next to wireless network connection to find IP address of wireless adapter. select detail.your IP address will shown next to IPV4 address. Alternatively, go to Start > Run, type "cmd," and press OK.
Alternatively, press the windows key and the R key at the same time, type "cmd," and press OK. In the Command Prompt window, type "ipconfig" and press Enter. This will bring up your IP address, DNS address, and other information about your internet connection. Find your IP address among the information provided. Click the network icon in the Notification area. Select Open Network and Sharing Center. Select Local Area Connection to view the IP address of your wired connection. Choose Wireless Network Connection <network name=""> to view the IP address of your wireless adapter. Click on Details and find your IP address next to IPv4 Address. Now you need to select the RUN. You need to Type the cmd in the box. Now select the Command Promp option. In the Command Promp, enter the ipconfig command and click Ok.
You will find the ip address. You can also get it to know through gmail account. Login and open the gmail account and at the end of the age, you will find the Ip Address. I will teach you how to find you Ip address k,just follow my steps k.
1.Choose Star, My Network Places and then properties k.
2.Double-click Local Area Connection to find the IP address of your wired Connection k.
3.Double-click Wireless network Connection to find IP address of your wireless adapter k.
4.Click support and then Details k.
5.Now the window that pops up will display your computer's IP address k.
Hello......... For window XP Go to start and go to in network properties. Double click to local are network connection to find IP address of your friend.. Double click to wireless network connection to find IP address of your wireless connnection. For windows 7 Click network icon in notification area. Select local are network connection to veiw IP address of your wired connection. Choose the wireless network connection to view IP address of wireless adapter. Click on details and find IP address next to IPVP 4. In Windows Vista Open the start menu. Click view status button local area connection to find IP address of wired connection. Click view status button next to wireless network connection to find IP address of wireless adpater. Slect details,your IP address will shown next to IPV4 address. 3. Type cmd in the text box that appears. 4. In the command prompt window type the following ipconfig/all. 5. Details are shown for each of the computer's network adapters. 6. The IP Address field states the current IP address for that network adapter. 7. The Physical Address field states the MAC address for that adapter. 1. From start menu, right click on network and click properties. 2. A Network and sharing center window will open. click view status to the right of local area connection. 3. In the local area connection status window that opens click on Details. Your IP address will be listed among the other connection details. In the same way the using the command prompt also we can find the IP address of the network. Basically there are two types of IP address are there for every computer system! 5:In details windows ipv4 address is your physical address! 1:Static ip address will be available online! 4:Your static ip will look like this 115.***.***.**. 1.Go to Run-->Type CMD-->Type "ipconfig" or "ipconfig/all"
2.Go to Control Panel-->NetWork and Internet-->select "Network and Sharing Center"
In both methods ip address starts from something 192. Different ways to check IP address..
Go to Start menu Click on Run or press windows key + R.
Open command prompt with cmd in run dialogbox..
Now type there IP config click on enter..
Now you can see your IP..
Go to Start menu and open Control panel..
Click on Network and Internet ..
And Now Click on Network and Sharing center..
Now click on Local Area Connection.. In this wizard Click on Details ..you will get IP address..
Go to Task bar Network option.. Right click on that Icon..
Click on open network and sharing center..
Now click on Change adapter setting..
Now click on properties in new wizard..
Now see your IP IPv4 or IPv6 Double click on that.. There by you need to click on " Network and Sharing center "
Under connection click on the "" VIEW STATUS ""
2.Then you click on the option 'Run'. 3.There you type 'cmd' and click 'OK'. 4.Then a command prompt will open. 5.There you type 'Ipconfig' and click 'Enter'. 6.Then you can get the IP configuration. And click on the Network and internet. Move to the Network and internet Sharing. Click on Wireless Network Connection. You can find the ip address there. 1. Open the Start menu. Right-click on Network and then choose Properties from the drop-down menu. 2. Click the View Status button beside Local Area Connection to find the IP address of a wired connection. 3. Pick the View Status button next to Wireless Network Connection to view the IP address of a wireless adapter. 4. Select Details. Your IP address will show up next to "IPv4 IP address." By using the command prompt you can find the IP address very easily.